If you go to the link below, you can see what people all around the world are saying about cloned meat, and if they would eat it. I have no problem with the notion of eating cloned meat. Personally, I don't see it as much different from producing insulin from bacteria. As long as the scientists are careful, there is nothing wrong with man made meat. There is NO WAY I would eat a steak from a cloned cow. Without a side of genetically modified potatoes and a few dashes of Tabasco sauce that is. But then, I also prefer manufactured diamonds, and I'm hoping we can grow steaks on a rack soon. God shall smote those who consume those satan cows! But until then Ill have a nice cloned cheeseburger. extra clone cheese. But while we are on the subject why cant we clone a person whats wrong with it? 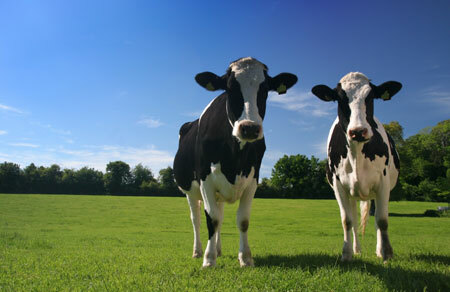 cloning is not going to make a cow bad but you could change the DNA to make a better cow. we should be making everything better that we can. We should do anything that is better for the human race. That is the only important thing is to continue to move forward, we have slowed down our progress lately. Obviously you can not harm humans in the process. Make a better cow with better beef, maybe less fat and more taste. Make better potatoes and corn and grain..... feed the world. If we have the power why shouldn't we use it for the better. Genetically engineered crops are all well and good, but the tricky bit is the politics and business part. The seeds of GE crops are sold to the growers, and the crops grown are sterile. So next year, the grower has to buy from the company again..... this cycle continues, and the seeds are pretty pricey, considering the work that went into them. GE foods are neat, but they're also restrictive. I love the science end of them, but I'm far less fond of the business end. At any rate, GE food is great in the developed world, but they aren't a solution in 3rd world countries, because the crops are just barely profitable; in a bad year, the 3rd world farmer goes bankrupt. God made the world perfect and man should not interfer. Cloning is the work of Satan! and all those who consume this tainted foul flesh of the Anti-Christ shall burn in eternal hell fire. I pray for your souls may god have mercy upon them. hmm... i recall no where in the bible it saying anything about cloning as work of satan, that is a purely human concieved notion. as for the ethics, thats where the controversy is. anyway cloned meat or anything for that matter at the atomic level has no difference with non cloned organisms. it is just a genetic replica. to say cloned meat would hurt u would mean that the animal it was cloned from was unsafe to eat and i highly doubt the animal it was cloned from didnt find its way to a slaughter house. as for cloning humans people see the fact that cloning someone would create a souless baby or something. all your really doing is making a twin of that person which has its own soul instilled in it by God or whomever u believe does soul instilling. I personally dont see the need to clone humans since what good is it to create a twin of someone. as for stem cells we are almost to the point now where we can create a big vat of the person's stem cells with their own nose stem cells without ever making a zygote. Hey... perhaps we can extract Jesus' DNA from the shroud of Turin or somewhere, and clone Him... then instead of crummy wafers WE COULD EAT REAL JESUS! Yum! Guaranteed ticket to heaven! If you really think there is NO difference between clones, you are sadly mistaken. The variability between individual cells in one organism is extremely small, due to naturally occuring mutations (sun exposure, diet, etc.) and occasional faults with DNA error-correction. You can't tell if one cell taken from an ear is more reliable (i.e. "normal" whatever that means) than a cell taken from an udder, and it is currently impossible to sequence an entire cell's DNA just to make sure there are no key mutations that could affect offspring. It is nonsense to assume that if cloned calves don't die and they look like every other cow, that they are exactly identical. Only DNA sequencing can determine that!! Anything less is faith, and as a rational intelligent human being I don't act on faith alone. You may wonder- well why don't humans have more mutation related problems if there are these errors? Because we have billions of redundant cells that all divide repeatedly so the "proper" ones can maintain function while certain others simply die off or become cancerous. Well, many people do get cancer so it's not so uncommon to have bad mutations. Well then, if an animal is derived from a single cloned adult cell, mistakes and all, one is putting all their faith on the reliability of a single cell. Over generations certain mistakes from this original cell can further mutate and may prove fatal to the animal. Worse yet, these progressive mutations may result in an increased susceptibility to infectious disease and cancer, and even greater propensity to form the wrong proteins, such as the ones that cause mad cow disease (it is contagious though it is not a living organism, but caused by malformed proteins). Not to mention, any mechanical process is prone to errors and failure, and sucking up DNA from one cell and injecting it into another is far from an elegant or efficient method, with disastrous implications. There is a great potential for physical disruption, which would result in catastrophic changes to DNA and its ability to control cell function normally. This could perhaps explain the 98% cloning failure rate, as most embryos fail to even divide, let alone make it to full term. Even with normally appearing animals, some early mutations in the cloning process could manifest themselves later on, with successive mutations over time in the cloned animal and its offspring. Cloning food is a disaster waiting to happen- and in GMO crops there are many disasters already occurring with the appearance of super-weeds, and entire crops' susceptibility to devastating new diseases. Animal and plant breeding is a selective process, and like evolution, animals with poor traits or unhealthy development are "deleted" from the gene pool because they are not propagated by breeders (ie, forced survival of the fittest). Cloning however is instantaneous and doesn't depend on environmental pressures, so there may be processes which malfunction but are not readily apparent in the scope of raising cattle for beef or milk, but could greatly affect the public's health in the long term. Some people cite the benefits of cloning, the potential for increased food supply and more nutrient rich foods. Before jumping on the politi-corporate bandwagon with this technology, the FDA needs to evaluate more data from independent sources. It's difficult to believe that the first animal was only cloned ten years ago, so all of our observations don't even cover the normal lifespan of an animal. How can the government so hastily market these animals for human consumption if our experience is so limited, and our measurements aren't even complete?? By rewarding intellectual laziness and maintaing ignorance. Educate yourself and make your own informed decisions!!!!!!! I would eat the cloned beef because scientists say that it is safe!